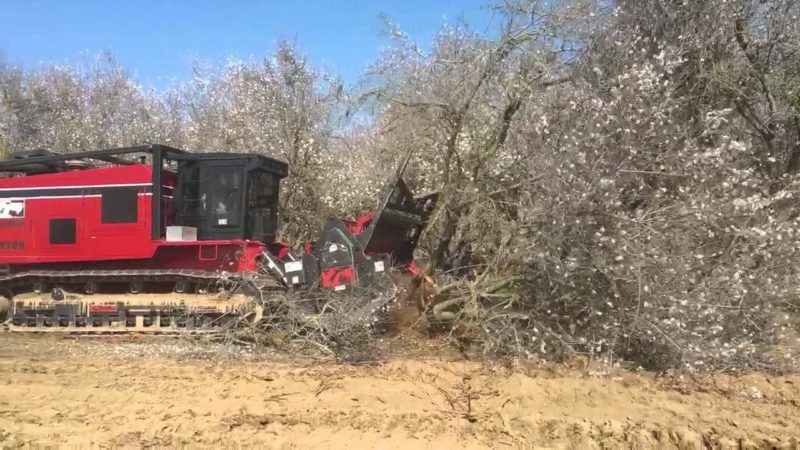 A fierce, 50-ton machine, aptly named the IronWolf 700B, has the potential to boost the sustainability and efficiency of California’s almond farming industry. Because of higher prices for almonds – and improved profits – California almond growers are expected to plant new orchards and increase production by as much as 3.5 percent over the next decade. Yet, growers face unique challenges as older trees need to be removed in order to make way for newer trees, which produce more abundant crops. It is estimated that 50,000 to 60,000 acres have to be torn down every year to address the lost productivity that occurs with aging trees. In a recent demonstration in Chowchilla, California, the behemoth rototiller showed some of the state’s almond farmers its tremendous worth. Taking a meager three minutes to take down a fully-mature, large almond tree, the IronWolf is capable of devouring three to four acres within an eight-hour time period. 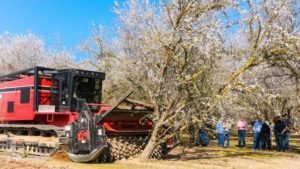 Originally designed for deforesting and road clearing purposes, this machine is capable of improving the livelihoods of California’s almond farmers because of the time and financial savings it offers. The IronWolf 700B goes beyond economic efficiency. It also has environmental benefits. Unlike the traditional methods that growers have been using to take down unproductive trees – which involve a lengthy, multi-step process in order to remove the trees and reincorporate the broken down chips into the soil, with the 700B, organic matter is quickly added back into the earth. This is due to the rototiller’s ability to effortlessly crunch whole rocks and chew up massive tree trunks with its 700 horsepower engine and powerful head. The resulting refuse is a boon to the soil, increasing fertility, nutrient content, and water retention. According to research performed at the UC Kearney Research and Extension Center back in 2008, by devouring trees with a machine like the Iron Wolf, the broken down wood chips and other organic materials also improve soil pH and prevent the problems with fungal and bacterial growth, normally found with ground plots. It is even possible that down the line farmers will be compensated for adding carbon to the soil. By building soil carbon and increasing above ground biomass, the almond farmers are effectively benefiting the environment. This is a reversal to the concerns surrounding the California agricultural industry’s water usage during the state’s ongoing drought crises. Brent Holtz, the director of the University of California’s Cooperative Extension, estimates the cost per-acre to be slightly over the expenses of the traditional removal, grinding, and disposal methods. While the time savings and environmental benefits are profound, the creators of the IronWolf 700B, Oklahoma-based IronWolf Manufacturing, plan on continuing to find ways to drive down costs. Everyone wants the most efficient solution possible for the almond orchards. The benefits of this machine for California’s almond growers are sure to make a big impact as the farmers expand their orchards over the next several years and are forced to find practical, sustainable solutions to the traditional challenges that the industry faces.